TWO standard interfaces - Mini USB and SD card for easiest direct communication with your PC - no added interface required. Longer battery life - Designed to conserve energy for data recording without interruption. Up to 3 years battery life at 15 min. measurement rate. 3 x AlMn Type AAA or Energizer. With its long-term stable humidity sensor, the testo 175 H1 is the professional data logger for the monitoring of temperature and relative humidity in work and storage rooms. The external probe stands out thanks to faster reaction times in comparison to probes installed inside the housing. 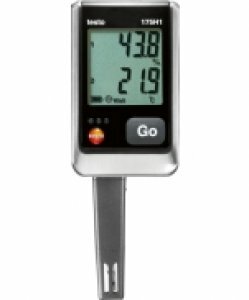 The testo 175 H1 continuously records temperature and humidity values and shows the dewpoint in the display. The indoor climate is well monitored, emphasizing the need for targeted ventilation and air exchange.